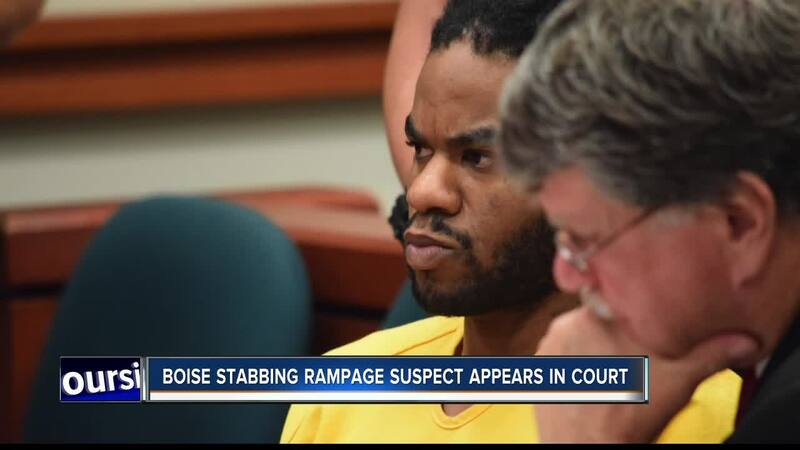 Grisly details in an Ada County courtroom Wednesday morning about a stabbing rampage that took place at a Boise apartment complex June 30th -- in which a three-year-old girl was murdered and eight others injured. The accused -– Timmy Kinner -– appeared before a judge … who read off the thirteen charges against him. Kinner is charged with first-degree murder in the stabbing death of little Ruya Kadir during an outdoor birthday party at the Wylie Street Station Apartments. Security was heavy at Wednesday morning’s hearing. Over a half-dozen bailiffs and deputies surrounded Kinner as the charges were read. Judge Nancy Baskin did not allow TV video cameras in the courtroom … only allowing still photos to be taken. Court documents say Kinner reportedly killed the three-year-old by repeatedly stabbing her –- including directly in the face. The documents also say Kinner allegedly stabbed a two-year-old … causing lacerations to her stomach, liver and pancreas. … and allegedly even chased a woman while wielding his knife. As Kinner was escorted back to the Ada County Jail, he turned and looked back at the woman -– surrounded and comforted by family and friends as she left. Kinner is expected back in court on August 28th to enter a plea. Prosecutors have yet stated if they will seek the death penalty in the attack.